Duncan Smith was ahead of Blair and now we are this far behind. Left or Right, I'm definitely in favour. What do you think? Our Campaign is on the Up, honest! "DC said the spliff was this big..."
"My oratory failed. Maybe my dancing will be better." I'm ready to help unravel your wool Michael. ...and I'm not a recent drug user!!! Now look here all of you. I'm not Mr Nasty - I don't slag off my fellow candidates. 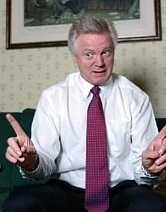 "So Mr Davis, how many of your declared supporters will stay loyal in this week's vote?"